On January 12, 2015, a team of scientific and industrial partners published the Roadmap ‘Catalysis, key to Sustainable future’. This roadmap will form a solid base for a strong catalysis -and process-technology program for the next ten to twenty years. Catalysis plays a crucial role within the Chemical sector; over more than 85% of all chemical products are produced via catalytic processes. This means that catalysis is directly relevant for the grand societal challenges the world faces nowadays, like energy storage, biobased economy, transport and health. The roadmap “Science and Technology Roadmap Catalysis – Catalysis- Key to a sustainable future”, describes the present contributions by the Netherlands’ catalysis community, and explains how catalysis can contribute to the grand societal challenges in the next 10 to 20 years. The first copy of the roadmap was presented on January 12, 2015 to ir. 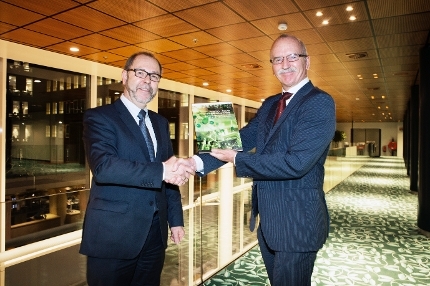 Gerard van Harten, chairman of the Topsector Chemistry and one of the promotors for the Roadmap. Prof. dr. Eelco Vogt (on the right; chairman of VIRAN and member of the core-team of Roadmap Catalysis) hands the Roadmap to ir. Gerard van Harten (on the left; forehead of the Topteam Chemistry). Photo: Harmen de Jong. The Roadmap was commissioned by the Nederlands Instituut voor Onderzoek in de Katalyse (NIOK), the industrial adviceboard of NIOK (VIRAN) and NWO Chemical Sciences. The roadmap is a collaboration between scientists –and industrial partnes in catalysis and the Dutch government. The Dutch government has appointed the chemistry sector as one of the nine Topsectors, because of its strong position and possibilities to grow further. Industries, universities, research-centers and government collaborate to improve the knowledge and innovation position. “In 2050, the Netherlands will be worldwide known as the country of green chemistry, the use of raw-materials based on biomass, and clean and sustainable processes”. Moreover, the Netherlands is in the global top 3 of producers of smart materials with a highly added value and smart solutions. Through high quality and groundbreaking scientific research in the Netherlands, new areas of science and innovations are made possible.